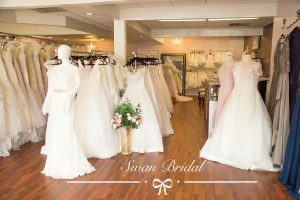 Artistic, colorful, free-spirited, outside-the-box, different, creative… do these terms describe you dear brides? 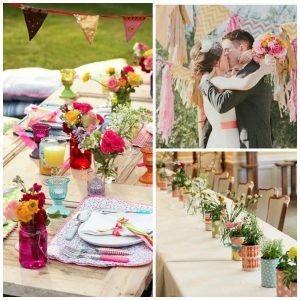 Then perhaps you will gravitate toward hosting a wild and wonderfully imaginative wedding day. 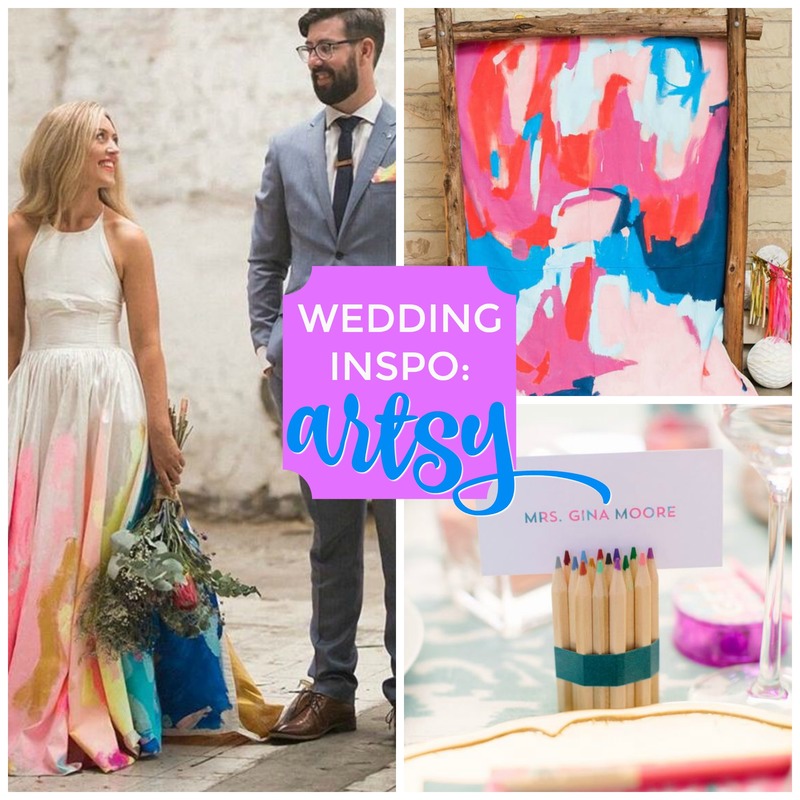 After all, your wedding is your chance to highlight your artsy style for all your loved ones. And pretty sure they won’t be expecting an ordinary event from you! 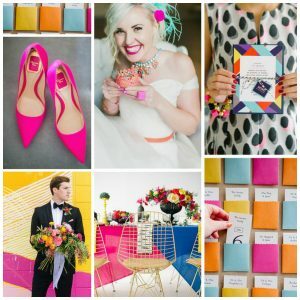 So throw the rules out the window and plan your wedding with abandon using bright colors, whimsical elements, and your very own sense of style. 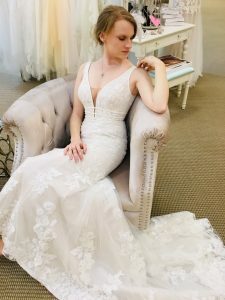 For your most important style element, your dress, visit your local Bridal Boutique to find something EXTRA, like this one from Lillian West. This crocheted gown features a geometric fit and flare with an endlessly romantic feeling. And, it is accented with a detachable stretch off the shoulder cape. 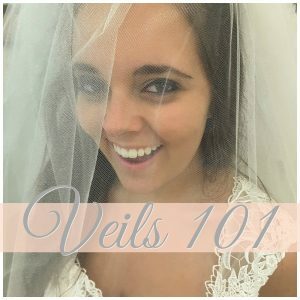 You heard right, a BRIDAL CAPE! 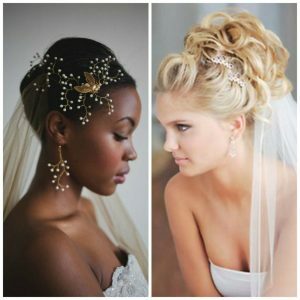 For your out-of-the-box bridal hair style try loose and natural, or top things off with a fun floral crown. 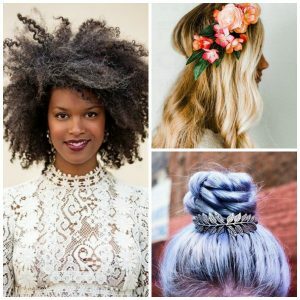 Or, turn up a traditional bridal updo with a fun hair color. Your bun might be pinned like Aunt Sarah’s was, but pretty sure her hair wasn’t purple! 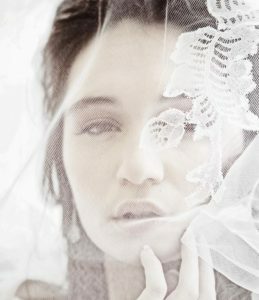 Other ways to infuse your wedding day look with inventiveness….Tie a beaded sash around your head instead of wearing a veil. 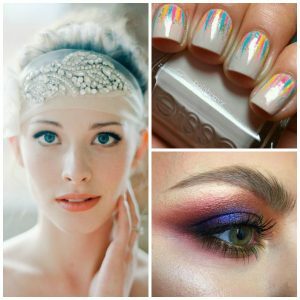 Add just a few rainbow touches to a neutral bridal mani. 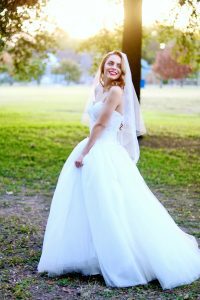 Go colorful with your bridal makeup. 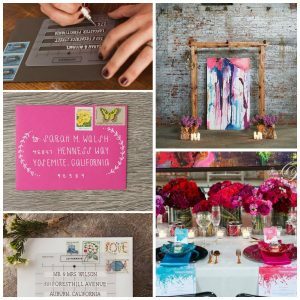 Give your invites a hand-lettered flair by using a handy guide to address your envelopes. Use your artistic skills and hustle yourself up a hand painted backdrop, like the one shown below from apartmenttherapy.com. 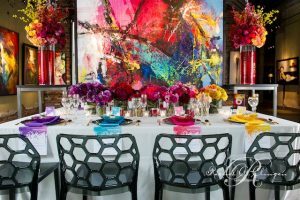 Consider using an ombre tablescape to add tons of interest to your tables, like the one below from a wedding that was held in the Thompson Landry Art Gallery and styled by premier wedding and event designer Rachel A. Clingen. 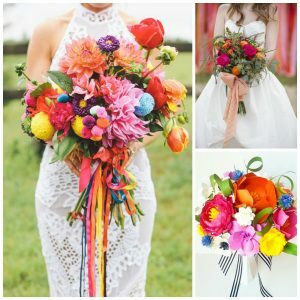 For your bouquet, try an exuberant mix of flowers. Or, you could use one of Paper and Peonies inspired paper bouquets. Accent your bouquet with colorful ribbons for even more personality. 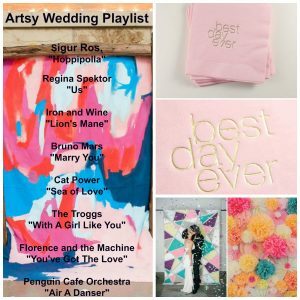 Your best day ever needs the perfect playlist, so we’ve compiled a few songs you’ll love. 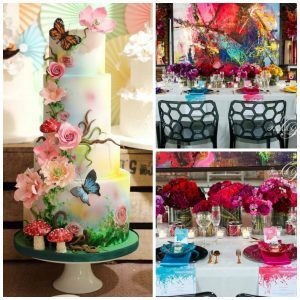 Paintings, floral elements, bright colors and whimsy all add up to a special day no one will ever forget. Your wedding cake is another chance to showcase your artistic proclivities. 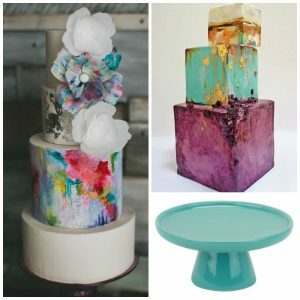 A three tiered white cake by Hey There Cupcake goes Jackson Pollock with splashes of vibrant color. Or, an off-center cubist stack of deliciousness provides tons of visual interest. More sculpture than wedding cake, this striking creation, “Gilded Earth cake,” is by Nevie-Pie Cakes. Turquoise cake stand available here. 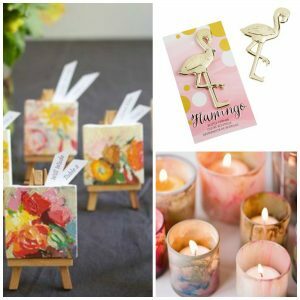 For favors, consider wee little paintings that double as place cards, fun little Flamingo bottle openers or watercolor votives. Or send your folks home with some sweet packages of crayons. 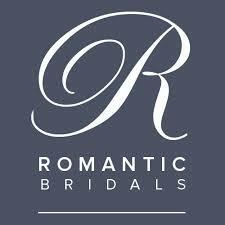 They will have been so inspired by your beautiful wedding they might just get creative themselves. 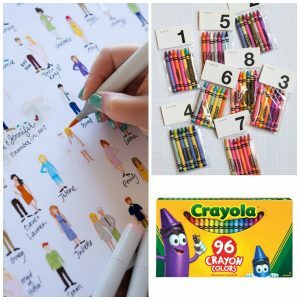 Also, a guestbook where the guests color themselves is a tremendously cool option from SomethingTurquoise.com. 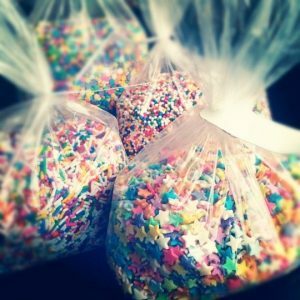 And instead of rice, have your friends and family shower you with colorful sprinkles. You and your fiancee can start your married life under a joyful shower of colorful, candy stars. That sounds pretty romantic, doesn’t it?